What is the Volcker rule? The headlines in the press describe a nebulously defined financial regulation as being the second coming of financial reform Yet the only thing clear about the Volcker rule is who it is named after, former Federal Reserve chair Paul Volcker. The Volcker rule was a last minute financial regulation rule in an attempt to stop speculative trading by Wall Street. It has been politicized, lobbied against, delayed, watered down and modified heavily. Welcome to Outrageous Economic Shorts, the reader's digest of economic horror. Below are studies, facts and figures that should be enough to make your hair curl. Unfortunately information like this pops up every week. Yet read it and weep, here's some of the latest. Just when you think they all got completely away with it, along comes one government regulator, the CFTC. The U.S. Commodity Futures Trading Commission issued a settlement with MF Global. The firm settlement consisted of full restitution of the $1 billion customer money lost plus a $100 million fine. Yet the CFTC also filed civil charges against former CEO Jon Corzine along with another MF Global executive, Edith O'Brien. Read more about Corzine Gets Sued! Wall Street is now winding their way through the swiss cheese loophole maze financial reform is. Remember credit default swaps, those deadly, bad math, bad computation derivatives which were behind the financial crisis? Have you ever noticed that large corporations can get away with pretty much anything? Over and over again a major scandal breaks and in the end the fines are pennies on the dollar for the profits gained by these nefarious financial activities. Banks can launder money with impunity and the consequences are a small fine in comparison to the profits made. No matter how egregious there are no criminal chargers or revoking of the bank's charter. The British bank Standard Chartered said on Thursday that it expected to pay $330 million to settle claims by United States government agencies that it had moved hundreds of billions of dollars on behalf of Iran. At first glance the record $1.9 billion HSBC fine for laundering Mexican drug cartel money looks like a solid. Yet buried in the fine print, HSBC avoids charges via deferred prosecution. Why are Gas Prices Skyrocketing? Déjà vu, it's 2008 all over again. Why are gas prices soaring through the roof? Some are revisiting oil speculation as the culprit. Commodity futures speculation always pops up in the public discourse the minute gas prices go above $3.65, yet nothing ever seems to come of it. Our usual stupid political tricks, from tapping the strategic oil reserve to the GOP blaming Obama for gas prices, are in full swing. Isn't this all getting rather old? Wouldn't we all just like a stable price fluctuation in a key critical commodity upon which our economy and our empty pockets depend? 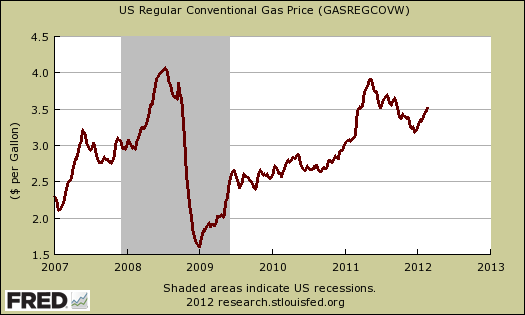 We know one thing, $5 gas can literally kill economic recovery. Oil shocks are correlated to recessions, as James Hamilton points out as do others. Below is a quarterly historical graph of real GDP percent change vs. the West Texas Intermediate average Oil Price. Notice the spikes in oil price and the grey recession bars. Read more about Why are Gas Prices Skyrocketing? Alphabet soup mnemonics like CDO, CDO2, CDO3, CDS, SIV, LCDS, CFD, plain zone people out and we stop paying attention. Such discussion is the brain's Ambien. Global finance a maze of highfalutin sounding words which really mean gambling.